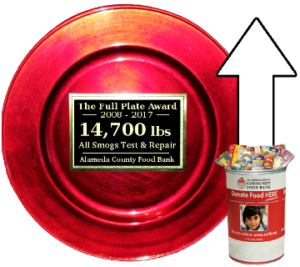 The Alameda County Community Food Bank distributes more than 380,000 meals weekly. They have more than 240 member agents (including us!). Visit there website and learn more about how you can help, accfb.org. The California Air Resources Board is a division of the California Environmental Protection Agency. They work for the people of California, via the Governor and Executive Branch. They are kind of like the hall monitors at elementary schools. They are also provide reports on California’s Smog Check Program. These guys are like the hall monitor’s best friend. They watch over auto repair shops to make sure they are not taking advantage of customers, and they try maintain a level playing field between auto shops. Plus they manage California’s Smog Check Program! They have a great FAQ for Smog Checks.